Another great shoot in the beautiful city of St. Louis. This time I was shooting for NFL Network’s “The Season”. I was especially excited for this shoot because I got to gear up with Sony’s PMW F3 and Zeiss CP2 lenses. 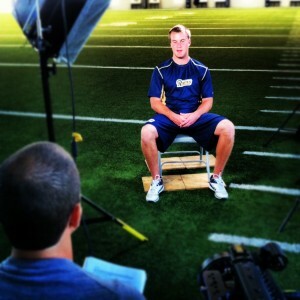 I set up our shoot inside the St. Louis Rams practice facility at Ram’s Park. We had access to the practice field, so what better place to do an interview with the field goal kicker, Greg Zuerlein, than right on the field! The interview was a 2-camera setup with the F3 on a lockdown shot and a 5d with Canon 70-200mm glass on a Dana Dolly for the moving profile shot. It was a great shoot! I even got a chance to try my field goal kicking skills! For the record, I am calling it a successful 30 yard field goal while my producer insists it was only 25 yards. Either way, it was a great shoot with an excellent crew! Watch out NFL, I may have found my new calling!